Marina and Emanuel got married in Täby Church and had their reception at Nygård Inn (Swedish: värdshus) in Täby, north of Stockholm city center in Sweden. I had the pleasure to be their wedding photographer. 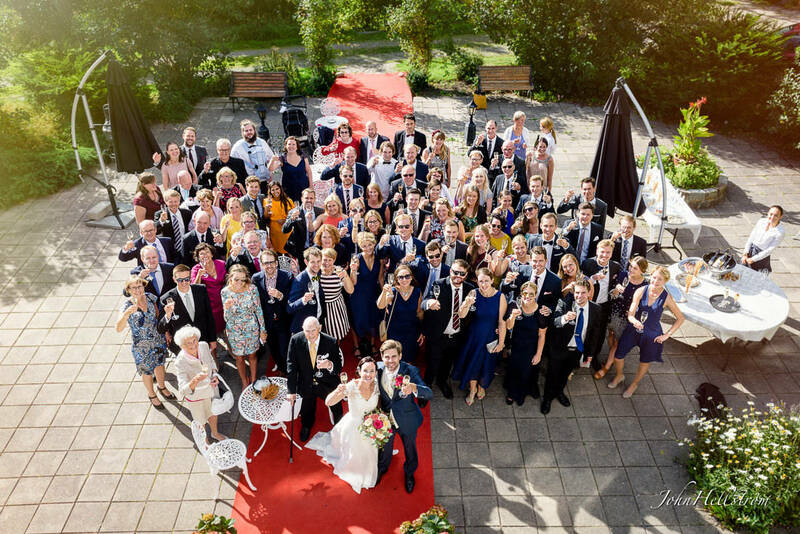 Above, you see a picture when the guests are blowing soap bubbles when the wedding couple comes out from the church. May I kiss my wife now? Täby Church (Swedish: Täby kyrka) is an old medieval church just north of Stockholm center. The church is best known for its painted walls and ceilings by Albertus Pictor. Wikipedia about Täby Church: "The church was built during the second half of the 13th century. It was first constructed as a square hall church. In the mid-14th century a vestry was added and about 100 years later the church porch was built. During the second half of the 15th century, the flat wooden ceiling was replaced by a vaulted ceiling. The altarpiece dates from the 1470s. A runestone is immured in the church porch. The church is best known as one of the churches with mural paintings by Albertus Pictor (died 1511). The ceiling frescos are from the 1480s and, unlike many of his other works, were never whitewashed over. They include a picture of a man playing chess with Death, a motif that inspired Ingmar Bergman to a famous scene in the movie The Seventh Seal. The motif is very unusual, known only from one other source." Q: How did you meet? S: At Cliff Barns bar in Stockholm the 16th May 2014. Q: How did you decide to get married? S: Emanuel proposed in Paris last autum. F: Something about your wedding day? S: The whole day was magical. We are so happy to share this with our fantastic friends and family.